How do I purchase a ticket?/ Do you make reservations?/ Can bookings be made abroad? Can you confirm the schedules? Can you provide me with ticket prices? How can I find all the connections with an origin/destination port? How can I find a destination? Where can I find your publications? Can I subscribe to your GTP guide? Can I place an ad in your guide? Are the summer routes available yet? Can you send me the GTR edition? Can you help me book a hotel?/ Are bus schedules available?/ Can you provide me with airline schedules? As a publishing company, we supply available information on domestic sea schedules only. For any further services, such as tickets, reservations and bookings, you should address the shipping company operating the route of your choice. Details for the shipping companies such as telephone fax numbers and e-mails are listed in our site. Our main sources of information are the shipping companies and the Merchant Marine Ministry. The schedules listed in our site are updated twice monthly after contacting and checking with the shipping companies. In the meantime, many changes can happen until the next time we update our site. Therefore, it is best to contact the shipping company operating the route of your choice and confirm your schedule before travelling. Details for the shipping companies such as telephone and fax numbers are listed in our site. The ticket prices are only included in our monthly travel guide "Greek Travel Pages". They are the official ones, that is before each shipping company adds on any premiums, percentage for discounts and commissions that differ from one shipping company to another. So, you have to contact the shipping company operating the route of your choice in order to be informed on the actual price. If you need to find all the connections of an origin or destination port, you have to type the location in either the origin or destination box only and submit your request. You will then get a drop down list of all the connections. There are three ways to search for a destination. The map search, the hierarchical search and the special search. Each one of these search methods helps you trace a destination within Greece. The map search assists your search through the use of maps. The hierarchical search gives you the opportunity to search within a specific Region or Prefecture. And, finally, the special search provides tools to search by postal code or telephone code, location name or location code, and a location by its classification. We are the publishers of high quality directories containing comprehensive information on travel and holidays throughout Greece. 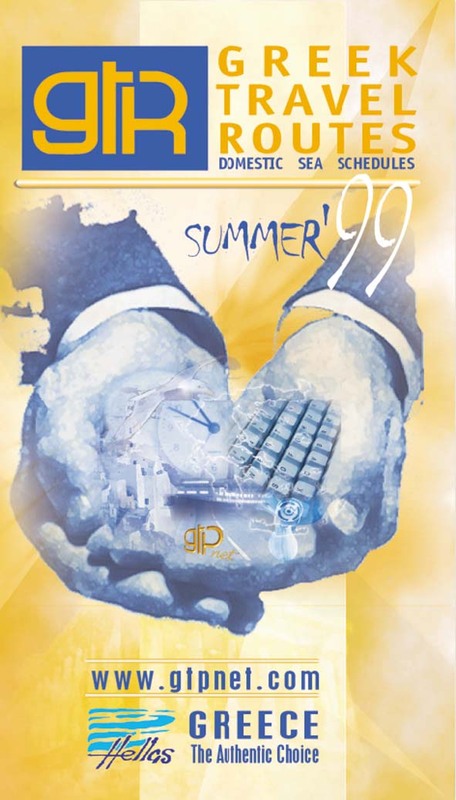 Our company, International Publications ltd., publishes Greek Travel Pages (GTP), the only monthly tourism guide that has established itself, since 1975, as an invaluable source of information for travel and tourism professionals. GTP is a working guide, published in the English language. It constitutes a continuous source of reference and combines practical, accurate and complete information on tourism, helping thousands of professionals around the world in their daily operations. It has become an invaluable tool for all professionals as it offers reliable and up-to-date information presented in a well structured, user-friendly, and high-quality format. The site, GTP.gr, is an extension of Greek Travel Pages, which electronically delivers useful information for the planning of holidays. We provide information to prospective visitors to Greece, as well as people travelling within Greece, relating to the country's extensive network of sea connections and accommodation, and we also provide geographical and useful details of any place in Greece. A wide variety of travel related information is also available through travel directory selection, such as details of travel agents throughout Greece and travel agents abroad selling Greece as a holiday destination, airline companies, shipping companies, yacht brokers, and details of any company related to tourism. To provide everything you want to know about Greece. But most important to lead the public with new products and services - intuitive rather than just analytical! Avoid the mistake of creating a site that looks as if it has been bolted on to a larger communication system, just to be a part of the Internet phenomenon. Creating reasons to revisit the site again and again - economies of customer retention. Finally, focusing on delivering reliable, up-to-date and accurate information in an utmost consistent way. On the 500 pages of GTP you can find the following information. 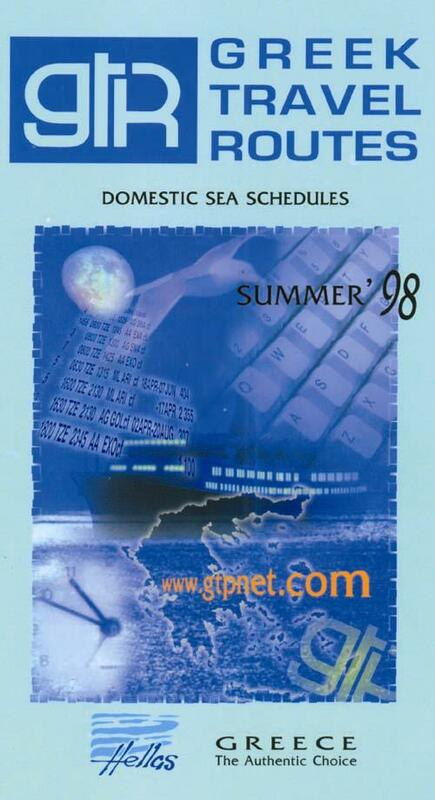 On its 144 pages you can find more than 22,000 Greek domestic sea schedules printed in an airline-timetable style and translated in six languages (Greek, English, French, German, Italian, Russian). It also includes a map that clearly distinguishes the six departure points along the port of Piraeus to the various Greek island destinations, information on Greek shipping companies and a list of their fleets, and details of the Hellenic Tourism Organisation (EOT) offices in Greece and abroad. 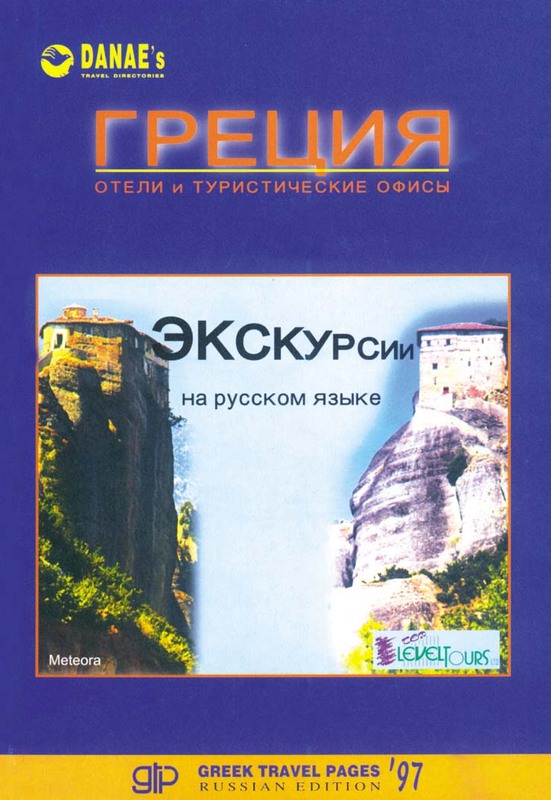 The GTP Russian edition is a unique publication and it was produced to combine, on its 256 pages, information on Greek hotels, Greek travel agencies, and agents featuring Greece from Russia, Belarus, Moldova, Ukraine, and Uzbekistan. The information is presented in both the English and the Russian language. This richly-printed 54-page edition includes listings for 150 deluxe and first-class Greek hotels, completed with full information on each unit, a color photo and official room rates or "door" rates plus the heavily discounted rate offered exclusively to members of the Greek diplomatic and consular corps all over the world. Twelve pages of the guide are dedicated to a listing of all Greek embassies and consulates worldwide. The "Greek Travel Pages" can be ordered by your office and sent to you by mail, while the "Greek Travel Routes" is distributed by the Hellenic Tourism Organization offices worldwide. Through our office you can order all other publications. coded in zip code groups according to post office requirements for discounted postal charges and prompt distribution. We can do the promotion for you through our special fax service. Tell us the message you want to promote, or the special offer, and your target travel-related sector, and we will do the rest for you. 2,500 travel agencies and 5,000 hotels in Greece plus thousands of other tourism professionals in Greece and abroad. Greek Travel Pages (GTP) is marketed to travel and tourism professionals worldwide. Its yearly circulation totals 115.000 copies with an estimated daily usage readership in excess of 157.000. The average monthly circulation is 7.000 copies. 14,000 to professional visitors to the int'l exhibitions: BIT, ITB, WTM, PHILOXENIA, MITT, BTF etc. Everyone can subscribe to our guide as long as s/he fills in a subscription order, which has to be sent to our offices by fax or e-mail. An annual subscription costs USD 250 for Europe and USD 280 for the rest countries. You can also apply for a single copy at the cost of USD 30 or for as many months' copies as you wish. You can pay with your credit card or remit to our bank account. Every company related to tourism is entitled to be advertised in our guide. By sending us an e-mail or fax we'll answer back giving you details of the advertising positions in our guide, their availability and the relative cost. The summer routes are listed in our special edition "Greek Travel Routes" published twice a year after the Hellenic Tourism Organisation's request. The first edition is published in March and contains the proposed schedules by the shipping companies to the Merchant Marine Ministry. Its purpose is to give a clue about the existing connections and their frequency. The second edition with the final and approved schedules is published in May. Both the March and May's editions are being distributed by the Hellenic Tourism Organization offices worldwide. 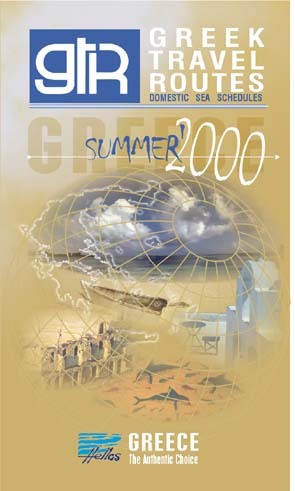 Our company publishes the "Greek Travel Pages" guide monthly since 1975. It contains information on hotels, travel agencies, rent a car offices, cruises, camp sites, bus services, international and domestic sea and air schedules, organized tours, yacht brokers, railway schedules, museums and much more. You could apply for just a single copy of our guide at the cost of USD 30 in order to be informed accordingly.